Fiat 500 car audio android 8.0 gps 3d navi touch screen dvd bluetooth wifi usb. This product page has been automatically translated. If you have any questions, do not hesitate to contact us. Fiat 500 android 8 car stereo 3d navi gps touch dvd bluetooth wifi usb sd. Universal usb dab + tuner / antenna digi .. universal carplay & androidauto usb ... Tire pressure tpms system for .. 2 x hd 10.1 "monitor for car kopfstüt ... The perfect navigation in car stereo of android oem + media player digital touch screen; it makes you feel at home while driving on the road. Navigation gps communication - entertainment -, hands-free phone calls and much more. Full screen display tft lcd provides some source you are watching or listening, with usb and therefore compatible with several formats, including jpeg, divx mpeg3, mpeg4 and so on. 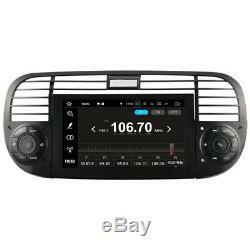 Buy this excellent navigation in oem car radios and enjoy your time in your car. Superior quality octa-core 1.6ghz processor, 4GB of RAM and amazing built-in 32GB flash. Airplay miracast mirroring screen & function - share videos or songs from your iphone and android phone to the car head dvd unit. Plug and play, keep original style - no modification of the frame cable or the initial power required. Built-in high speed wifi adapter and google play goals to download various apps from android market. 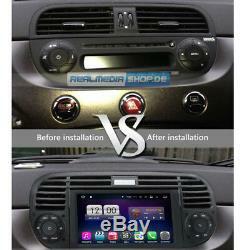 Easy installation, just exchange with lautoradio factory. Intuitive intuitive 3D interface in different languages. Touch screen control system via the screen or the full graphic buttons. 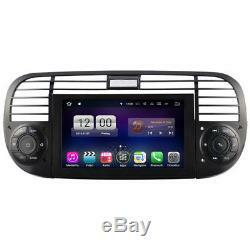 Built in gps system with dual zone function: (listening to music in navigation mode). Anti-shock system and electronic and mechanical vibration. Cd / dvd player media format: cd, cd-r / rw, mp3, mp4, wma, dvd, dvd ± r / rw, dvd-mp3, avi, xvid and jpeg more. Usb / sd slot / sdhc - for music, photo and video, play music and videos directly. A2dp - stream music via bluetooth directly. Bluetooth for hands-free phone calls, synchronization of mobile phone phone book contacts. Supports all smart phones eg htc, nokia, samsung, lg, iphone, etc. Auto memory - all settings and positions are saved automatically. 2-zone function before and navigate dvd, tv or back view video. Back function area - video playback on the back of the monitors to navigation in the maindisplay. Function day & night display - adjust the brightness of the screen automatically. Rear camera - with automatic switching function when reverse gear is engaged. Custom & restore settings eq pop, classic, rock, jazz, bass / treble / balance control user. Illumination of 100% bonus buttons with an original car lighting. 4 x audio output, subwoofer output, 2 x video out, 1 x to video in. 3-d high-definition navigation system menu instruction and voice gps in 28 languages ​​2-d 3-d map display with auto-zoom, real display 3-d building chip and eco road planning, assistance in the way highway with real display of highway signs. Android operating system - all android gps software can be installed the latest data cards for 45 countries of eastern and western europe and poi database. Note: we also have gps maps for usa, canada, israel, australia, new zealand, united arab emirates and african countries etc. Optional accessories: not included in delivery, but can be ordered otherwise. Hd dvb-t2 tv receiver type no . Apple carplay & androidauto usb module type no . Dab + digital radio adapter type no . Of tire pressure control: 4260555382341. Hd dvr dashcam type n °: 4260555383058. Hd monitors type n °: 4260555382112. Obdii auto diagnostic check type no . 1x + multimedia navigation system. Power cable 1x + canbus decoder. 1 x audio / video cables. 1 x pdf manual in English. The payment sale bill or lease-sale is only from our shop and requires a successful credit check by klarna gmbh. And select the desired payment method. All other information is available when ordering. 8 android with octa-core 1.6ghz processor, 4GB of ram and 32GB flash + google game stores numerous android apps. Benefit from faster multitasking, as well as the latest features, including optimized memory management. Integrated mirroring screen: link airplay & mirror miracast for the transmission of image and sound from apple iphone and android phones. Built-in Wifi: for a direct connection to wi-fi hotspots, smartphones. Installing plug & play without additional adapter or mounting frame linking unit becomes child's play. Original custom design that is coordinated on the vehicle's equipment. With current gps navigation maps and free update, permanent about us. Installation: simply replaced with the original radio. Intuitive interface in several languages. The 3d interface, user friendly control the system via the fully graphical screen or buttons. Resolution of 1024 768 hd with capacitive multi-touch control. CD / DVD player reads cd, cd-r / rw, mp3, mp4, wma, dvd, dvd ± r / rw, dvd-mp3, avi, xvid and jpeg and many more. Sd / sdhc / usb / ipod connection - for music, photos. Bluetooth hands-free phone kit with contacts directory synchronization. Bluetooth a2dp - streaming music: supports all mobile phones, android or iphone. 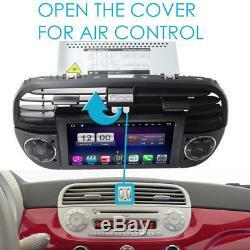 2-zone function - radio, television, dvd, or listen to music while browsing. Super electronic shock / vibration system 3 sec. Cd / vcd and 90 seconds. Auto Memory - all settings and positions are held automatically. Back function area - before and navigate dvd, tv or video look back. Day and night display function. Google play stores for many android apps. Custom equalizer and reset settings (pop, classic, rock, jazz, bass / treble / balance control user). Key illumination to match 100% of the original car dashboard light. Reverse camera connection - with automatic switching function in reverse. Outputs of 4 x audio 1 x to the A / V input 1 x video, 1 x subwoofer and usb port. The current maps for 45 countries in Eastern and Western Europe and database installed poi menu and voice guidance in 28 different languages ​​tmc traffic messages online only with the internet access model. Mobile hotspot wi-fi 2-d or 3-d map display with auto zoom, realistic 3-d terrain representation 3d landmarks, chip & eco route planning, roadway help with realistic display of motorway signs etc. System d android operation - principle can be installed a navigation software, which is based on android remark: so we provide only gps maps for usa, canada, israel, australia, new zealand, united arab emirates and african countries etc. Optional equipment: may not be included but are further classified. 1x connection cable with canbus decoder. 1x audio / video cable. Pdf datasheet - download here. 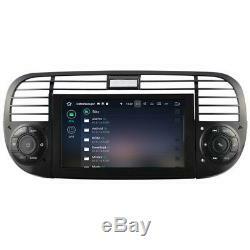 The item "fiat 500 car audio android 8.0 gps 3d navi touch screen dvd bluetooth wifi usb" is for sale since Wednesday, May 23, 2018. It is in the category "auto, motorcycle parts, accessories \ car radios, hi-fi, video, gps \ gps, navigation \ gps laptops ". The seller is "www-realmediashop-de" and is located in / in neuss. This item can be shipped to the following countries: America, Europe, Asia, Australia.